Get Your Blog Google-Ranked In 30 Days or Less? WebProNews has an interesting article about getting your blog ranked. They tell you to forget about PageRank. Hey….I’m down with that. 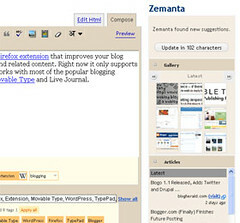 “Blogs have been around long enough to become standard elements of the web landscape. They’re easy to construct and manage, they create fresh, user-generated content and, if well-executed, blogs draw crowds and the attention of search engines.